Today's Bradenton Herald is filled with year-end flashbacks -- and what a year it has been. But with a few days left of 2008, I wanted to revisit a really bright spot from just last week. Reporter Donna Wright talked us into running a story on Delsie the cat and Rachael the dog -- the two animals holding the current records for the longest stay at the Humane Society of Manatee County. Well, talk about a success story. The very next day, both animals were scooped up by loving new owners. Rachael and Delsie went on to wonderful homes with their new families yesterday and so did record breaking numbers of equally deserving dogs and cats. There is absolutely nothing that could have made our staff and volunteers happier and I can’t thank you enough for the joy you have filled us with this holiday season. Both Delsie and Rachael’s adoptive families told us that they were not “in the market” for a new pet. It was the eloquently written article detailing Rachael and Delsie’s individual stories and the compelling photos that led each family to seek out the Humane Society and answer our Christmas prayers. I am profoundly touched by your kindness and I hope you will extend my heartfelt thanks to Tiffany, Robert and your editors too for their roles in making this Christmas miracle possible. I am deeply grateful that The Bradenton Herald has a heart and soul – our animals, our organization, and our community are very fortunate beneficiaries as a result! So give your pet a hug and a treat this Sunday morning. And if you're a bit lonely and need a furry best friend, check out the Humane Society. There's a little guy taking Delsie and Rachael's places. Good morning, it's Christmas 2008. We've unwrapped our presents, the coffee and mimosas are going quickly, and the Mormon Tabernacle Choir is singing "Joy to the World." The joy has been tinged with so much pain and desperation lately. In reporter Robert Napper's story today, we have just a glimpse of how too many of our neighbors are fighting to survive. When Robert came back to the office yesterday to post a "breaking news" story on Bradenton.com, he told us of the jolt when, almost from nowhere, homeless men came forward for the kind help of Kim Johnson and Shelley Troyer. Editor Jennifer Rich had tears in her eyes as she worked through the story. That compassion led the newsroom to quietly donate this week to help another family, suddenly homeless at Christmas, when Barbara Brownell, program director of the Family Partnership Center, e-mailed us about their plight. As sports news editor Alan Bellittera said as he emptied his wallet, "They need this far more than I do." Anyway, it did help out this morning as I went to link to my Sunday column online for this blog. Alas, the night crew hadn't sent it to "NetNews" -- the online queue in our news system that gets swept for stories to post. In the past, I'd have to alert someone in IT or call an online guru. Now, I just fire up the laptop, sign in and click the column through. Now, however, I'm returning to my piles of newspapers. They're still my Sunday favorite. I got the sterile form letter several weeks ago: My homeowners insurance was being canceled. It was an out-of-state notice from State Farm headquarters, and the "sincere apologies" added insult to injury. My family has been insured by State Farm since time began, it seems. Dad always used State Farm, and I've made my payments dutifully since I turned 16. All our car insurance, all our home insurance, all of our policies have been State Farm -- we didn't shop for bargains, we went with Old Reliable. Well, whatever hurricane never arrived in Manatee County but posed a threat apparently changed that. As of Jan. 11, 2009, my home, like so many others, won't be covered by State Farm. So I grumped my way over yesterday to my still-reliable State Farm agent -- I selfishly think Wayne Scroggins is the best in Tampa Bay. Imagine my surprise when I learned that the Scroggins had lost their home insurance -- and he's been working for State Farm for four decades. We've signed up with Citizens Insurance, and actually will save a sizable amount. So the glass is half full, right? The Miami Herald launched a 10-part series today examining the movement led by Fidel Castro: the Cuban revolution that affected millions of people, not just in Cuba but throughout Florida and the world. The Bradenton Herald taps into that series in today's editions and here online. As the editors explained today, the series will explore whether anything was achieved in a nation that now boasts a highly educated populace, but one steeped in economic despair. Like the hundreds of thousands of Cuban-born Americans who have come to the U.S. to think, write, pray and politic freely, Cruz has watched the watershed events on the island — such as President Fidel Castro’s convalescence and brother Raul’s ascent to power — take place from afar. On the eve of the Cuban revolution’s 50th anniversary, he and other area Cuban Americans remain skeptical, if not hostile, of what followed the 1958 ouster of Cuba’s strong-armed President Fulgencio Batista. "Fifty years after Fidel Castro took power in Cuba, the big question about the Cuban revolution is not whether it was justified, but whether it was worth it. From all available evidence, it wasn't." I was at the Columbus Ledger-Enquirer, another McClatchy newspaper, yesterday for an editors' meeting, so I first read reporter Robert Napper's story on coyotes online here. It remains one of the more heavily trafficked stories today on Bradenton.com. It's a fascinating issue, and comes very close to home. Full disclosure: I, too, live in northwest Bradenton's Hawthorn Park and don't like sharing it with these coyotes. We've seen them circling right in the back of my house, and you can hear them all times of day -- not just at night. And I worry for the safety of my dog -- a little guy who thinks he's a ferocious bear when he needs to "protect" me. So we're being extremely careful, and the advice in Napper's report is helpful. Another full disclosure about my puppy, Joey, and a reason to celebrate: Today is his 14th birthday, and we're taking a vacation day to commemorate. Happy Birthday, Joseph Pulitzer Krauter! Note on "Letter from the editor"
Thanks to Steve Metallo for opening his classroom to me last week for my column today. He's "Mr. Metallo" to most, and that's reassuring. Respect for our teachers will go a long way toward a better tomorrow. Manatee County's Economic Development Council for its solid belief in this community. Each year, the EDC honors companies with its "Excellence in Industry" awards. OK, so times are tough. That only prompted the EDC to champion this recognition even more, culminating in today's luncheon. Each year, I'm reminded how much business is generated within Manatee County that has global impact. The lunch crowd was smaller this year, but it still filled the Bradenton city auditorium. And the most notable thread through all the acceptance speeches was "family." Whether by blood or community, each winner talked of family and promise. Mixon Fruit Farms has been here for 70 years, founded by the Mixons' grandfather. Their loyal employees' average age: 65. MyUS.com has grown to reach 30,000 customers in all corners of the world in just 10 years. Robrady Design helps create products from people's dreams. How cool is that? Galati Yacht Sales, founded in 1970, has five siblings running the company. They've been in Manatee County all their lives, and love it. Gould & Lamb, a medical bill processor, is one of the fastest-growing companies in the country. And they're based right here. The Bradenton Herald's business staff produced a special section on the winners -- kept under tight security, of course -- that we handed out at the luncheon. You'll find it in Thursday's editions, and here online. Key in producing the sections were Business Editor Jennifer Rich and Night/Sports Editor Kamon Simpson. It's our way of paying tribute to stellar local companies. I'll admit it right up front here: I'm a coupon fanatic. If I don't save 20 percent on my weekly grocery shopping trip, I'm bummed. So when I read Herald reporter Donna Wright's report on coupon experts, I was humbled. These folks have it down to a fine art. And what better timing than now, when the top of everyone's conversation is how to save in these tough economic times. If you missed it in today's Bradenton Herald, here it is online. This link also takes you to Herald photographer Paul Videla's video, "A 9-minute lesson in couponing." The Bowers have some great tips. We also launched a new blog, Bargain Blogger, where Herald employees will explore the best money-saving tips with you in the days ahead. Today's Sunday Herald doesn't have the typical grocery inserts printed by Newsamerica and Valassis because it's a major holiday weekend. Instead, there are plenty of local vendor coupons, thanks to our advertising department's blitz. Check out pages 6B & 7B in the local section. My day started with three voice mails from readers thanking us for the front-page stories about so many in our community who are "Giving Back" the past few days. Talk about great therapy! And as reporter Donna Wright noted in today's Surviving the Squeeze story, far more of us are reaching out for therapeutic help today. Here's another note that started my week off wonderfully. We want to commend the Bradenton Herald for printing the "joint adoption" story in your paper on Saturday, November 22nd. With all the "gloom and doom" in the world today, it was refreshing to read such a beautiful story.... especially on the FRONT PAGE! Thanks again! Sometimes, taking thanks and sharing it with everyone feels fantastic. The past week brought new challenges for many of us, and too many reminders that times are tough for a growing number of our friends and neighbors. But as we head into Thanksgiving week, the Herald's newsroom staffers are renewing their vows to remind readers how they can help. Teaya Perez, we hope, will be one of those success stories. And there's been some instant gratification from other stories we've done, as noted in my Sunday column. We also published one of the most complete lists of how to help in Manatee County -- and where to get help -- on the editorial pages today. Pick your favorite -- and then act on it. And if you need help, reach out. One of our hands will be there. Little can be more refreshing than the excited words of a child. A teacher’s assistant from Rowlett’s magnet school recently shared such a note with our photographer, Tiffany Tompkins-Condie. Tiffany had captured the photograph posted below for the Herald's election coverage, and the featured little girl wrote about her experience for her third-grade class. Her letter is filled with energy and pride -– the perfect thing to share with you on this blustery morning. Thought you might like to see what Mackenzie wrote. On the Friday before the election, I went to go vote early with my Mom. We drove to the place, and we saw a big line there already. Luckily I had brought my "Friendship according to Humphrey" book with me. (I am a bookworm.) It was hot outside, so they had water bottles a little ways up the line. When it was our turn (FINALLY!) to go in I was relieved of air conditioning. Cool! I had never seen a ballot before! When we were done voting we gave the ballot to a man who put the ballot in a machine that slurped it up. Then he gave us both an "I VOTED" sticker. I walked out of there proud that I had seen voting when I was only 8! I can't wait until I can do it myself. And I was in the newspaper for it! Thanks, Mackenzie and Gretchen. You have my vote. As the weather turns crisp, I'm reminded that our readers treasure some of the smallest pieces of information our newspaper provides. Our weather map, published on the back page of the front section every day, holds hundreds of these details. And whenever it changes, we hear about it. I have noticed in the last couple weeks that the cities of Ft. Wayne, Ind., and South Bend, Ind. have been omitted from the national weather contact list of cities. I look for those cities because I have family there and that's home area for me. Was just wondering why they are omitted. This is to inquire as why you have removed the City of Peoria, IL from your National Forecasts listing. We have lived in Bradenton since 1994 and have always been able to check our hometown weather, but that particular listing has been deleted. As a Bradenton Herald Subscriber for many years I am asking that you put Peoria back in your listings of cities under National Forecasts. It may not be a significant listing to the Herald weather staff, but it is to us and several of our friends who are from the Midwest. Well, they're back -- and I received almost as many calls thanking us. And though it may be sweatshirt weather here in Bradenton, our low is still warmer than all these cities' highs today. It's going to dip into the teens in Peoria tomorrow. You gotta love Florida! Jim McCartney called me to make a date -- for his farewell luncheon. Ouch. We had pared back on correspondents' funds, and that included the meager amount we paid Jim each month. And he wasn’t going to let me off the hook that easily. Jim is a veteran journalist -– from the “golden years,” as he told me over lunch. A retired national correspondent and Washington columnist for Knight Ridder, Jim has covered so much history and countless politicians. His portfolio includes the transitions of power to the Kennedy administration, the Nixon administration and the Carter administration. For those of you who might not know Jim, his political leanings as a columnist sometimes redefine liberal. So he was only half-joking when he questioned why the ending of his Oct. 26 column in the Bradenton Herald had been cut. Even his conservative buddies noticed that the headline referred to Sen. John McCain as a “loose cannon,” but that Jim failed to state that in his column. Well, it wasn’t a conservative plot. His column fell victim to our first week on a new system, and those paragraphs somehow became invisible on the printed page. They made it into our archives, and you can read the column in entirety here. Reassured, Jim chuckled a bit as he made me an offer we couldn’t refuse: He’s going to keep writing for the Herald, and add the transition of power to the Obama administration to his portfolio. Good morning, it's Sunday, Nov. 9, 2008. And it's a Sunday morning with talk shows and headlines dominated by change. In my column today, I wrote about some of the change within our newsroom and our community. -- This Week on ABC: Host George Stephanopoulos has a journalist roundtable discussing the transition team under President-elect Obama, and whether he should join a special session, go for the "Big Bang" of change come January, and more. -- FOX News Sunday: Host Chris Wallace talks the future of the Congressional GOP, Mike Pence and Eric Cantor, and to former Clinton Chief of Staff John Podesta, who now runs Obama’s transition. -- Meet the Press on NBC: Scheduled guests were Obama-Biden transition team co-chair Valerie Jarrett; Florida's Republican Sen. Mel Martinez; and Rep. James Clyburn, D-S.C.
-- Face the Nation on CBS: Host Bob Schieffer scheduled talks with the Obama transition team. Not a bad Sunday morning, with my newspaper, hot coffee, channel surfer and pal Joey snuggled up. The sun is shining. The newsroom is always a great place to be on Election Night. Results are coming from so many sources now -- it's a race to see who has the most complete numbers first. The hum in here is invigorating -- just as it was at the polls Tuesday, with the banter and excited anticipation of historic change everywhere. We want to continue tapping that energy. What were your experiences? You've posted some of them throughout the day. I noticed on one of our fellow McClatchy newspaper sites that they were capturing dozens of comments with one posting. I've borrowed the idea here for you to comment. 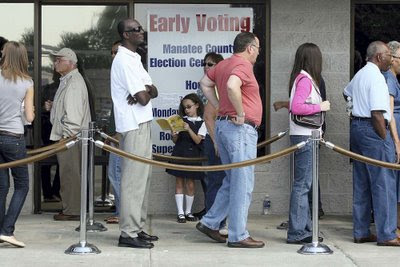 What was it like at the polling places today in Manatee County and beyond for this historic presidential election? How were the lines? Did you get the ballot you expected? What was the best comment you heard? On this Sunday Before Election Day, the politicking was heavy just about everywhere. Today's Brunch on the Bay was no exception, as many of our local candidates turned out to shake hands with so many community leaders gathered under one tent. But politics had to take a back seat for the real reason everyone was there: to celebrate the gift of education. The University of South Florida has grown to become the ninth largest university in the United States, President Judy Genshaft proudly noted. Since it began, the Brunch on the Bay Scholarship Endowment has secured more than $1.5 million for USF students. The brunch is held on the lawn of the Crosley Estate, neighbors of the USF Sarasota-Manatee campus, with a breathtaking view of the bay. "Show up. Stand up. Speak up. Make a difference." This fund-raiser's success is a stellar statement to the importance of higher education in our community. It's a testament to the area's determination to continue nurturing critical thinking and leadership -- one key way to defy a lagging economy and set the momentum for change. I hope the politicians were listening. Interest in the presidential election is at a fevered pitch in Manatee County, with early voting setting records and the campaign moving back this week to our battleground state of Florida. The Tampa Bay area is a key target. Gov. Charlie Crist extended early voting hours to 7 a.m – 7 p.m. through Saturday, including at Manatee County’s one site at 600 301 Blvd. W, 941-741-3823. Democratic candidate Barack Obama is in Sarasota today, where he is expected to continue the charge for early voting at Ed Smith Stadium. We will provide online updates on his visit throughout the day. Caroline Kennedy was in New Port Ritchie on Wednesday campaigning for Obama. Republican nominee John McCain was at the University of Tampa on Wednesday, where reporter Carl Mario Nudi covered his visit. But Carl couldn’t get in to hear McCain’s speech – it was limited to “pool coverage,” which means one representative of print media was allowed to report on the event and then share that coverage with other media. We challenged that setup, trying to get our own report for this local news event. Instead, we had to rely on that pool report, with Carl gathering interviews from the crowd outside the speech. I question why, within a week of the election, both candidates wouldn’t want as much exposure as possible for voters to decide. The only difference is the first 5½ innings are in the books and the score is tied 2-2. With just 3 ½ innings left, there is a strong possibility the team that scores first wins. We'll have full coverage in Thursday's Bradenton/LWR Herald, and here tonight on Bradenton.com. In cheering for the Rays, my St. Louis Cardinals loyalties weren’t challenged in the least for this series. I am loyal to my Cards to a fault. But I wanted our hometown Rays to win so badly, and their run was exhilarating. PHILADELPHIA – Carlos Ruiz’s dribbler up the third base line with the bases loaded and no out in the bottom of the ninth inning scored Eric Bruntlett and gave the Phillies a 5-4 victory over the Rays in Game 3 of the World Series. The hit came at 1:47 a.m. Rain delayed the start of the game 91 minutes and pushed back first pitch to 10:06 p.m., making it the latest start time in World Series history. And by 1:49 a.m., Roger had the final score posted to bradenton.com. "Game 3 Web-only stories were posted to Bradenton.com at 2:05 a.m. and 3:50 a.m." for all the final interviews and analyses. Whew. That's one long day for these guys, who started their jobs both in Bradenton and in Philadelphia around noon Saturday. But then it is the World Series. And it's our job to get you the news, as quickly as possible. And we're playing it on 1A for you -- well, at least most of you, as I wrote in today's Letter From the Editor. Here's hoping for clear skies -- and even spunkier Rays -- tonight. Talk about multi-tasking for multimedia results! Several of us were discussing new laptops in my office today, and in the background my TV was tuned into Bay News 9's noon report. Suddenly our business editor's voice joined the conversation -- as TV broadcaster/biz editor Jennifer Rich. Funny how TV can give you instant fame! She was only steps away, sitting in front of the camera we have installed in our newsroom for "talkbacks" with Bay News 9, our TV partner. But we gathered around the TV, cheering her on as if she was miles away. She's been a regular this week, representing the Herald as Bay News 9 reports on the economic meltdown, in its "Watching Your Money" series. One phenomenon Jennifer discussed was reporter Grace Gagliano's story today on pawn shops and how much business has increased. People are pawning their jewelry so they can afford medicine and gasoline -- it's that desperate. Stay tuned -- here, on TV and in print -- for your news. How are we 'Surviving the Squeeze'? Last year, the Bradenton Herald published a series of stories that examined "Manatee's Money Squeeze." As the housing crisis gripped Florida, as insurance costs spiraled out of sight and property tax increases crippled the average homeowner, we wanted to know what was happening to the middle class of our community. Topics included housing, employment, insurance, retirement, disposable income and consumer goods. The roller-coaster economic meltdown is causing many of us to reconsider major life decisions.We're finding ourselves, friends and families faced with huge choices: "Should I take that job instead of going to grad school? Should I postpone that dentistry work and make sure I can pay the mortgage? How will I pay for my kids' college tuition? Should I delay retirement -- or do I even have a choice?" We're looking for smarter ways to ride the storm out. Today, the Herald starts an occasional series, "Surviving the Squeeze." These stories will examine real-life dilemmas, seek advice from experts, and find tools to help our readers learn to cope, react and change. And, we hope, find a touch of hope and humor along the way." In today's story, reporter Sara Kennedy examined the dilemma faced by many baby boomers: What about my retirement? She explored this through some real-life situations in traditional story form. As this coverage evolves, we also plan to use more alternative story-telling forms. The goal: to build a stronger network throughout the community and help put each issue in perspective. Our biggest news in the newsroom today: We have a new computer system! You wouldn't believe how long we've waited for this day. It's not without its glitches, which is one reason I'm blogging on this. We're relearning every step of production, and there are hundreds. That's no excuse for the mistakes you noticed in the paper today (Ronald Reagan is not Bill Galvano, despite our tagline; John Folds was sentenced in the DUI case, and has only one spelling of his last name), but it contributed. As we learn our new system -- Saxotech -- it will give us more time each day to focus on production details, both in-print and online. Our old computer system was literally not a member of this century. We plan to have a smashing goodbye party in the very near future! We've heard from a growing number of readers in recent days who are clamoring for information about the six proposed amendments that are on November's ballot. Their calls and letters may signify a trend that more citizens are voting early. They want to be informed as they cast their votes, and they don't want to stand in the traditional lines on Election Day. And they're turning to their local newspaper for that information. The prominent races tend to get plenty of coverage, both online, in print, on TV and radio. It's encouraging that voters are looking at the entire ballot, because some of these changes to our state's Constitution can have longer-lasting effects on our lives than any single candidate. In today's editions, reporter Nick Azzara took a look at the controversy surrounding the proposed Amendment 2. That initiative would make gay marriage unconstitutional in the state of Florida. As Nick's story points out, proponents believe this issue shouldn't be decided in the courts and belongs in the constitution. Opponents say individual rights should not be threatened by such a measure, and they warn that the amendment might affect far more than gay couples' rights. It appears voters will decide this by early November. However you decide to vote, please make an educated choice -- not just an emotional one. They turned out in force last weekend to prove just that. Sure, this may be a bit biased -– the event was our Bradenton.com’s inaugural “Battle of the Bands.” But I don’t need to sugar-coat anything. This community is blessed to have such a wide range of bands that thrive on local support –- and feel lucky to be here. Battle of the Bands was the brainchild of Bradenton Herald’s Interactive Media VP Jackie Luper and Advertising VP Erin Humphreys. What better way to generate some new revenue than to tap into one of the most vibrant scenes in our town: The Bands. Posters went up all over town, and dozens of bands made the deadline for the finals. Heading into last weekend, 28 bands were named finalists to compete Friday and Saturday for the grand winner. The finalists were awesome, and while the contest was deemed a “battle,” the synergy among competing bands was astounding. For hours, guitars, drums, bass, keyboard and fans rocked the Manatee Convention Center. The categories: rock, country, jazz/blues/reggae, and Christian. And they had the chance to win more than $3,000 in cash and prizes. All local talent. All here to strut their stuff for local fans. Full disclosure on my part: When Richard McNeil, our online designer who grew up in Jamaica, learned that I was a judge -– and that included judging the Reggae category -– I almost had to call 911 to revive him. He was literally in tears of laughter. But my love of music prevailed, and I humbly joined a great panel of judges to pick the best those nights. My thanks to the Herald and all staff involved in this event. It could not have been organized and executed any better. The event staff ran things flawlessly and professionally. I have never performed a large venue where all went so smoothly. Special thanks to Tracy Conrad, who kept it all together and made it a real pleasure to be a performer. I hope this will become a regular event. Great job on setting everything up, it was an awesome show. Thank you so much for allowing us to be a part of everything. We loved meeting everybody and hanging out. You guys did an awesome job! Be blessed. Hey, this is Bill, the drummer for Meeting Aaron. Thanks for an awesome time yesterday. The band really enjoyed themselves. Things couldn't have been run much more smoothly. Everything was on time and all of your staff was terrific. The tech and sound guys were extremely professional and made every band sound great. We got a kick out of all the cool video. The ladies from the Bradenton Herald are the best! Thanks and I hope you'll do it again next year. Thanks for the great time, and the opportunity for us to play! Hope we can do it again next year!!! Thank u all for having us!! We all loved it and had a fun time performing in the battle! Note: Our Bradenton.com site has been more than a bit sluggish this morning because of technical problems with "Pluck." Many of you have called, thinking the site is down. It's not, but it was sloooooow. Pluck is the "social media tool" being used on our site to eventually host all of the comments, forums, blogs and other content. Other well-known sites that use Pluck range from USAToday.com and RollingStone.com, to all the other McClatchy newspaper sites. But there was a glitch in Pluck's network upgrade over the weekend. In the interim, McClatchy Interactive is removing Pluck from all our sites until the issue is resolved. As McClatchy Interactive notes, we apologize for this inconvenience. And thanks for your patience. My first phone message early yesterday was from Linda McKinney, daughter of our beloved Paul Bartley. She didn’t leave any specifics, just an urgent request to call her back. But the news was already laced in the heavy sadness of her voice. Her dad, my friend, our smiling inspiration, had passed away just hours earlier. We have lost an institution, both in the community and at the Herald. For years since he “retired,” Paul’s daily routine included a trip through our newsroom. He’d stop in my office just to check on me – and then sneak a chocolate fix and warn me not to tell his better half, Ruth. He’d spend most of his time with his golfing buddy, Managing Editor Jim Smith, sharing some rather tall tales. And then he’d schmooze with everyone in the newsroom, working his way back to His Desk in the photo department. That corner is really a shrine to Paul, capturing years of service and days gone by. Paul’s newsroom tour always included a stop at the metro desk, where he’d check the obituaries going into the next day’s editions. He knew, better than any of us, who had helped shape this community, and he flagged many a deserving story on those pages. “Just checking to make sure my obituary’s not here yet,” he always joked, his shoulders shaking with that famous chuckle. Tomorrow, those pages will include Paul Bartley’s obituary. And our hearts are heavy with the thought he’s not around to check. Just days ago, Paul gave me a huge hug when he learned I had lost my grandma. He kissed my cheek and told me how lucky my grandma was to be loved. I’m the lucky one, to have met Paul Bartley and learn from him what “community” means. As I head to Texas this coming week to celebrate Grandma’s 95 years of living, I know Paul is still taking photos of every cherished moment. We had a 1A teaser this morning to a special section highlighting some of Manatee County's innovative, diverse businesses -- timed to help commemorate Industry Appreciation Week in Florida. One big problem: The section publishes in tomorrow's Herald. Our editors jumped the gun in placing that teaser today. I hope you look forward to Monday's "Investing in Business" and its focus on industry. In the meantime, there's plenty more to enjoy and explore in the Sunday Herald and here online. Some might think combining communication and culture would be an oxymoron. But Leadership Manatee proves that it works, at least once a year. I had the honor of joining a luncheon panel today for the 2008-09 Leadership Manatee Communication and Culture Day. We met in the South Florida Museum's board room, where you'd think the toughest competition in keeping the group's attention would be Snooty and his girlfriends swimming in the tank right behind us. We were there to talk to this year's Leadership class about our media, how we cover news and events in "our community," how we differ, and how these business leaders -- employees and employers -- can get media coverage. Which subject received the most questions? If I were a betting person, I would have placed my money on "How do I get my story into the newspaper"? How refreshing to be proven wrong! Of course, all the panelists had already assured the crowded room that our focus is on "local" -- and that means their stories are our bread and butter. But the key questions from the audience today focused on fairness, ethics, change of leadership in Manatee County -- and that's music to journalists' ears. Thanks to Maggie Mooney, a Leadership Manatee graduate, for organizing the luncheon. The passionate interest in how our industry is evolving was food for the soul. Eight weeks and two days until Election Day. Sixteen e-mails since midnight from Obama supporters. Fourteen e-mails in the same 11 hours from McCain supporters. Coverage of the bid for president (and, increasingly, vice president) will undoubtedly continue to warrant front-page headlines many days in these next weeks. And the Herald will continue to strive for fair balance as John McCain and Barack Obama head toward the finish line. We don't exactly count the headlines, but we do want even-handed coverage, as I wrote in my column today. But my mailbox is way too full for a Sunday morning. A bench by the beach without a Blackberry sounds like the way to go. Despite my protests that it's prime baseball season, there's nowhere to hide from the onslaught of football. The stats are already getting inked for high school and college teams, and the big guys are lined up for this weekend. And Pigskin Picks are back in the Bradenton Herald, bigger and better than ever. We have lined up our local high school coaches to put their picks out there for college games and the NFL each week. Check out today's sports section on Page 5D for the first full lineup. As of late this morning, the ballots were already starting to come in. Here is our online component with even more picks. As the promo challenges: Are you ready for some football? Each week, the winnings are $100 for first place,$50 for second and $25 for third. And the coach with the best record this season gets $1,000 donated to their high school from Lakewood Ranch Dental. Here’s an update on the e-newsletters we’re sending out regularly from Bradenton.com –- and a nudge to sign up for the regular blasts. (I didn’t even know we had already launched a couple of these, so consider this a shared nudge.) Here's a link to register. The e-mail blasts are a gentle reminder to check on the latest news or business headlines -- or take a break and think about food and wine! Before I signed on for the news e-letters several months ago, I thought they might feel too much like a chore every day. But they actually end up saving time by saving me a search for the links to stories or blogs I should read. It contains all the local news from that day’s edition of the Bradenton/LWR Herald. This offers you a roundup of the day’s local news, and a preview of some key local stories that will appear in tomorrow’s print edition. These are sent by our metro editors throughout the day, alerting you to developments in key local stories, significant new local stories and, sometimes, national/international breaking news. This is a collection of the day's local business news, stocks, the latest local columnists and new posts on Business Reporter Brian Neill’s blog, Taking Stock. A weekly look at food and wine coverage highlighting local events, local tips from our staff, and insights from local foodies and connoisseurs. When we launch our new website, the related e-letter will include all the advice, questions and information from local women about becoming a mom and being a mom. This will include local real estate news updates from reporters and reports from industry insiders. Blogs, photos and more. Have ideas for other e-letters you’d like to receive from Bradenton.com? Let us know. I spent the past week visiting my family in St. Louis, and found it almost too easy to keep up with the local news via Bradenton.com. Almost everyone in the world but my mom has a computer. But there's still something quite comforting to come home to this stack of newspapers, packed with short and long stories that either didn't catch my eye or that I didn't do more than scan online. And, just maybe, I took a vacation from the news for a bit. Here's hoping a lot of you are making this a lazy Sunday, catching up on news, family and friends. Good morning, it’s Sunday, July 20. Thank goodness there's Snooty. We're celebrating our county's mascot on his 60th birthday with unabashed glee. As our story says this morning in the Herald, at least 5,000 strong turned out for Snooty's party yesterday. Now, for a guaranteed smile, check out Herald videographer Paul Videla's Snooty video. Turn up the sound and sing along. There is hope for the streets of Manatee County. But there have to be a lot more gentle souls like our favorite manatee among us. As you peruse Bradenton.com this week, it would be almost impossible to avoid seeing some of the cruel commenting on our coverage of two horrific tragedies. We have deleted the most offensive, and continue to try monitoring the others. I've blogged here before, beseeching these commenters to show some decency. And I know this challenge is shared by Web sites worldwide. But it really hits home when it's about our neighbors, their families, their friends. Yes, there also is some really sensible, thoughtful commenting on the stories. But the nasty ones drown out those voices. It's not the comments about our coverage, either, that anger me. It's some of the comments about these young men and their families. Johnny Gordon and Travis Fricke died when their speeding car crashed and cartwheeled this weekend. And 19-year-old William White Jr., a former Bayshore High School student, was shot to death Sunday evening. Arrested in connection with his death are two 18-year-olds, Timothy Brooks and Cody P. Rogers. Many were sensitive, wise and insightful. Others were crude, vulgar, racist and stupid. Shockingly so. I won't dignify the lowest of the low by repeating those postings here, but there is nothing funny about someone losing their life in an accident or homicide. I hope you all can help us weed out the cruelty before it permanently damages free speech. One of our tougher story choices these days is not if we’ll publish a story about someone needing help, but choosing which agency or individual should get the headline. The abundance of these stories is too telling, and the number of people in need is mounting. Reporter Donna Wright found a measure of this need in her 1A story today, “Making it stretch.” In the past year, the number of households using food stamps in Manatee County has gone up almost 50 percent, Wright learned. She also wrote about efforts to help stem that hunger, particularly a food network that operates through Cornerstone Ministries. Manatee County has eight host sites for SHARE sponsored by local churches and community centers. Participants place orders for food packages once a month, ranging from meat to vegetables and fruit. As Donna notes in her story, the only requirement to participate is to volunteer either for the network or in some other community capacity for two hours a month, wherever participants choose. I think we ought to all fulfill that requirement, regardless of whether we need the food package. That might help turn the tide. When I arrived at work yesterday morning, my voice mails included a rather terse (that's being polite) message from a reader. For the life of him, he couldn't understand why Samoset Elementary's space camp would be on Page 1A in his Bradenton Herald. He didn't identify himself or leave a number, so I couldn't return his call. It gnawed at me -- why not showcase local kids having a joyful learning experience? Why not have that "galactic good time" displayed front and center for a change of pace? Your article on Samoset: “Galactic good time” was an absolute thrill for our students when they heard and saw their pictures in the newspaper and on the internet. Thank you for all sharing your time with our Samoset family and making this summer a thrill for the children. As a teacher there is nothing more exciting than seeing our students thrills on their faces when they have done something positive especially while learning. You have given the students an experience they probably will never forget and may well be one of the most successful times for them. My son worked very hard on the music part of the project and was extra rewarding for him to get such great recognition. It was also very exciting and made me very proud of him and his dedication and to be recognized for his work was wonderful. Again thank you for time and consideration for Samoset. That one thank-you makes it all worthwhile. Here are links to Tiffany's story and Grant Jefferies' photo gallery, in case you missed them. There's also three audio soundbites attached, thanks to Tiffany. The sun is shining, and we’re celebrating a long holiday weekend full of joys, challenges and some heartache. The pages of the Bradenton Herald capture some of that today: a slice of history recorded from the Cortez Family Reunion, a whodunit in a cold-case story by Natalie Nesa Alund, and a good ol’whistle-stop campaign in Parrish. There’s developing news on the salmonella front, and Jessica Klipa came in on her day off to report on the latest suspects and growing frustration for many of our farmers. County reporter Nick Azzara delved further into Manatee County’s efforts to make development pay for itself and the struggle with impact fees. And, yes, thank goodness, there’s baseball. I promised a Letter from the Editor about our love of the game and growing love of the Rays. And we woke up to another winning score from baseball’s No. 1 team. Added bonuses: The Cards won 5-4 in the bottom of the ninth and my brother was there to celebrate, and the Brewers edged the Pirates 2-1 in another cliffhanger. We’re nipping at your heels, Cubbies! Forget foreclosures and impact fees for a bit. It's baseball season. And we have a winning home team -- what joy! As Roger Mooney noted in his blog, the Tampa Bay Rays ended the first half of the season Sunday with the best record in baseball, not to mention the best record in team history after 81 games. And that was before they started this winning series with the Boston Red Sox (more on that in Sunday's column). "The locals are starting to take notice -- in their (the Rays') past 12 home games, an average of 28,026 fans have attended the Trop, as compared to the average of 17,671 fans who attended the Rays' first 32 home games," Lembo wrote. About five years ago, Bradenton Herald reporters asked a fairly straightforward question of Manatee County officials: Where are the impact fees collected from developers being spent? At the time, county officials shrugged and pointed the reporters to boxes and boxes of miscellaneous reports and untallied data. The Herald published a critical series showing that county officials had no formal tracking system for the collection and spending of impact fees, or for the impact fee credits being given various developers. In a time of fevered development, that was particularly startling. Fast-forward to today’s stalled economy, with some of the same county officials at the helm. Reporter Nick Azzara asked the same question late last year -– and the results were disturbingly the same. Now, after months of queries and tabulations, County Administrator Ed Hunzeker and Commissioner Joe McClash say they recognize the need for accountability. In today's article, Azzara examines the numbers that McClash gathered for his own document. McClash says he used audited numbers from the annual budget reports for the past 21 years to compile his document, but the report itself is unaudited and could contain errors. Why the reluctance to turn the report over to an auditor? These are your public monies, not some private business investment. (To see how much the document states has been collected and spent in your district, go to this online map.) Manatee County residents and developers alike deserve accurate answers. Over the next months, the Herald will continue to examine how millions of dollars should be tracked and spent -– especially in this tough economy. I was overwhelmed this morning to find tributes to me in my Bradenton Herald. This is the sort of treatment you're lucky to receive when you retire or -- gasp -- go to that great newsroom in the sky. I have no idea how she was able to track down old cohorts in places like Minneapolis, Sacramento, Atlanta, St. Louis and Washington, D.C., and then somehow convince them to write such nice things about me. She probably thought it was going to be easier than writing her Sunday column. I know it wasn't. Vin Mannix also devoted his Sunday column to me, and several other members of the Herald newsroom weighed in on the tribute page. I was preparing a batch of chili this morning when I stopped to read the Local section. I had no idea tears could sting so much, and the jalapeno peppers were only partly to blame. Thank you all. I value my experiences with you, and have rich friendships and memories to keep me going well beyond my Herald career. You are the reason I was able to survive in this business 33 years. Thanks also to readers and friends in the community who have called and emailed with good wishes. I will be calling or sending notes to all of you. For the past five days, we have published highlights of an eight-month McClatchy investigation into the detention system created after the Sept. 11 terrorist attacks. What the reporters found: The United States imprisoned innocent men, subjected them to abuse, stripped them of their legal rights and allowed Islamic militants to turn the prison camp at Guantanamo Bay, Cuba into a school for jihad. You can also read the evidence in this archive of documents obtained by McClatchy in the course of the investigation. And here’s a link to NPR's Andrea Seabrook interview with McClatchy's Tom Lasseter. When Jim asked me to “edit” his column late Friday, I couldn’t wait to read his latest prose. He’s one of the most gifted writers I know -– and if I could offer any tweaks, well, it’s always an honor. But I wasn’t prepared for the power of Jim’s tribute to his dad, Eugene Smith. It’s a beautiful Father’s Day gift, and an elegant insight into a great father. Make that two great fathers. As you read his Letter from the Editor again, think about Jim as the devoted Dad of two beautiful kids of his own. He never asks for that recognition, but his words portray the strength of his love of fatherhood. On this day, we thank all great fathers in this world and beyond. I know I miss mine. These were just a few of the many words of wisdom shared at Manatee County Chamber of Commerce’s 29th annual Small Business of the Year Awards luncheon today. The Bradenton Municipal Auditorium was packed with 300 entrepreneurs, all there to honor this year’s best. The event is always one of the most genuine reflections of the honest, hard work that holds our community together -– and this year was no exception. This "incredible but true" tidbit comes courtesy of Greg Curling, our chief financial officer here at the Herald. This is a note for restitution. Back in the late '60s my mother would send me to pick up a Sunday paper. On 2 different occasions I inserted the coins and pressed the coin return button and pulled open the door, taking the newspaper and the returned coins. Please find enclosed a $50 money order for payment and interest for the stolen newspaper. Sure enough, tucked inside was a legitimate money order for $50. Untraceable, yet far from impersonal. Sure, there might have been a guilty conscience behind it all. But how cool that somebody cared enough to take the time to set things right. Here's a hearty "Thank You" for brightening our day. I'm glad Joan devoted Sunday's Letter From the Editor to acknowledge some of the newsroom's best recent work. We probably don't spend enough time thanking our staff for their efforts, both individual and collective, in producing quality journalism. She does that in today's column. We're not in it for the awards, as Joan points out, but it's an honor when some of our best efforts bubble to the top in journalism competitions. Such was the case recently when the Herald won 16 awards in two different state contests. Recognition from the Florida Society of Newspaper Editors and the South Florida Society of Professional Journalists includes writing and reporting, design, photography and -- here's proof that the business model is expanding -- online blogging and slideshows. These are among the first journalism awards we've received for work generated specifically for Bradenton.com, and photographer Tiffany Tompkins-Condie deserves mention for her military moms blog and a terrific slideshow on PAL boxing. We wanted to share this good news with Herald readers. Paula Heap, director of communications for Saint Stephen's Episcopal School, is closing the digital divide -- in Tanzania. And she's blogging here in Crossing the Digital Divide on Bradenton.com for at least two weeks. Her goal: to help Saint Stephen's reach out and expand the communications between their school and the Lugalo Secondary School in the town of Iringa. Education reporter Sylvia Lim suggested the blog, and wrote about Paula's plans in this story. Now, in the blog, Paula has written of the primitive travel, her first sights of Iringa, her first day in class -- what an adventure. We hope you enjoy learning about this Global Outreach with us, thanks to Paula. In the midst of a grisly weekend for news here in Manatee County, we received a joyous e-mail about a wonderful story. I want to share a bit of it here, hoping it will warm your hearts as it did ours. Neena and Tim Derf wrote a couple gleeful notes of thanks for columnist Vin Mannix's front-page story last week. The story was a celebration of life -- the Derfs' greyhound was turning 20. That's right -- 20 (we figured that's at least 140 in people years). Genie was born May 5, 1988, according to her papers with the Greyhound Pets of America. If you missed the coverage, here’s a link to it, Paul Videla's video and Tiffany Tompkins-Condie's photos. Well... we had to say a BIG THANKS! Exceptional story...and it made SO many people smile! ESPECIALLY THIS MOM & DAD!!! I actually had tears running down my cheeks... FRONT PAGE... FRONT PAGE!!! Woo HOO ! Too cool! THANK YOU SO VERY MUCH!!! This is such a difficult time for adoption groups...so your decision to run such a BIG story about our girl will most certainly help other animals find good homes. Can't say thanks enough! WOW!! We love you Bradenton Herald and staff!!! We were so thrilled when your columnist, Vin Mannix called to say he wanted to do a story about our exceptional 20 year old greyhound, Genie! He told me that his sister in Oregon was emailed a local TV news video about her, and sent it to him! We're honestly NOT surprised, as we have people as far as Australia, UK, France, Germany, England, Canada that have sent Birthday messages and presents to Genie in honor of her special day! People we've never met have sent donations to greyhound adoption groups in her honor!!! Genie's been a calendar girl for the past few years...and featured in magazine articles! But...even with that press... what means most to us... LOCAL PRESS THAT PROMOTES GREYHOUND ADOPTIONS!!! The day of Vin's scheduled visit, we were more than surprised by the still camera photographer.. AND video journalist too! WE ARE THANKFUL that OUR LOCAL NEWSPAPER recognized the importance of spreading the good word about our special greyhound! Greyhound racing is a fact of life...as are the thousands of retired greyhounds who desperately need good homes. The present economy makes adoptions increasingly difficult. I can't tell you how many joyous phone calls and emails we've received since Vin's piece! People wanting to bring greyhounds into their homes...and people THRILLED to see GOOD NEWS on your front page. People who might not have considered taking home a senior dog, but now will. And those who called to say that they pray THEIR special dog will live as long and well as our Genie! It was amazing for you to entertain putting our dog in such a spotlight. She's thought to be the oldest greyhound in the WORLD! Yes! And she's Manatee County's best ambassador for adoptions! Please thank Vin and his crew for doing such an outstanding job! The whole piece was FUN! From the tease at the beginning of the article... to my comment about "No privacy" at the end of the video! FUN!!! The pictures were exceptional...and the video!!! WOW!!! We want to thank you for promoting Greyhound Adoptions! They are exceptional dogs that make the BEST of PETS!! Here's a link to at least one local adoption group. Or call Greyhound Pets of America/Tampa Bay at (727) 595-7852. Today's Letter from the Editor gives you a glimpse into one of the daily discussions within our newsroom: what belongs on the Herald's front page. And the headline in question centered around "American Idol" and our local contender, Syesha Mercado. Most days, either Jim or I are making those decisions. As he points out, tradition has pretty much gone the way of fat newspaper staffs. And Bradenton.com has turned that into a non-stop discussion -- what should be the dominant photo? How often to change out? Should that breaking news stay on the home page? What's the sexiest headline to get the most traffic? Rather than merely agonize, though, we find ourselves having a bit of fun. It was almost a relief to have Syesha up for discussion with her fresh outlook on stardom, her strong ties to home and her whirlwind tours. And we won't share the newsroom banter that surrounded the "Daves." Newsroom humor is often our method for behind-the-scenes coping. When your staff is immersed in the latest murder case, the spiraling economy, soaring foreclosures and school cutbacks, a terse joke sometimes is the only thing to break the tension. And just when we think we've found something new... well, do a google on The Front Page. Reporters Ben Hecht and Charles MacArthur wrote an award-winning play way back in 1928 that starred Hildy Johnson in a steamy Chicago press room, filled with bad jokes, agonizing decisions and good gumshoe journalism. That's the press, baby. And we love it. Florida is the political hot-spot this week for the presidential race. Today, with most observers saying he's got the Democratic nomination in the bag, Barack Obama is stumping in the Tampa Bay area. And we'll be posting live coverage throughout the day. Reporter Maura Possley is at the St. Pete Times Forum, where Obama is scheduled to appear at noon, along with photographer Tiffany Tompkins-Condie and videographer Paul Videla. The plant I worked at for the last 10 plus years suddenly closed down last November. Since I am over 50, no prospective employers will even grant an interview much less hire me . . . we may be homeless in a few months' time . . . This came from a Manatee resident in response to the Bradenton Herald's series exploring the foreclosure crisis gripping our community and many others across the nation. He has depleted everything and missed a mortgage payment. Will the lender work with him and his wife to try and prevent another foreclosure? How about all the others? Can our legislators at the state and federal levels help stem the bleeding? What else can be done? These are questions we'll be addressing in the weeks ahead as we further explore the devastating toll of foreclosures in our community. As I recapped in the column, our reporters found the final tally for 2007 came to 2,528 foreclosures in Manatee County. In the first quarter this year, that number was already approaching 1,200. In this online foreclosure package, we have built an interactive database with these numbers, and tracked where they have hit hardest in Manatee neighborhoods. But the real stories are told in the videos and words of those trapped in this nightmare. We'll continue to add to this package as you help us find solutions. An online reader sent me a good question yesterday: Why did we still have John McCain’s photo as the link to our political page? It had been there for weeks -- and the Democratic contenders are still going at it. Day Editor Jennifer Conklin had the solution: Let’s get all three out there. Take a look at our home page in the bottom left corner. And if you haven’t perused the political content on Bradenton.com, you probably will spend some time there. Here’s a direct link. The latest headlines are compiled here, along with interactive calendars, polling results, delegate updates, and summaries of the candidates’ positions. You can even get some entertainment with a political horserace game. Just think -- the finish line is still six months away. How surprising is it to see the Tampa Bay Rays atop the American League East Division standings? This is a great feeling. After sweeping the Angels and taking two from the Yankees, the feel-good Rays have won six straight and sit atop one of the toughest divisions in baseball. OK, it's still May — they have 123 games left to play. But go ahead and enjoy the moment. The argument gets more convincing with every victory. What is it like to see the future flash before our eyes? It's always that way when Manatee County's top high school students take the stage for the Golden Herald Awards. We might as well add humbling. That's the beginning of today's Letter from the Editor, commemorating a grand event last Thursday. For the past 31 years, the Bradenton Herald has honored the best and brightest of our high school seniors. We've been honored to be part of the event for the past nine years. Each time, our faith is renewed in this community's future. As we were leaving, co-sponsor Todd Hoskins of AutoWay Ford stood with his wife and son outside of Bradenton Auditorium, still grinning from the thrill of giving Dacia Thompson the lucky prize of a Ford Mustang lease. In just seven more years, his son expects to be among those seniors on the stage. That's great promise -- that every year, we'll continue to watch outstanding students launch into their future, with well-earned recognition. Here's to Manatee County's future. You'd think the President was in town. Hey, it's far better than that. Syesha (no further introduction needed) is in Bradenton. And the town has gone wild. If you'd told me a month ago that we'd have five reporters, two photographers and a videographer dedicated to covering an American Idol finalist -- well, I would have had some choice chuckles for you. But that's our plan today to keep track of Syesha and her extremely loyal local fan base. Stay tuned -- we'll have updates throughout the day with photos, audio and more. And we want your photos added to this link on Bradenton.com. Our Down Home Cook, Diann Greene, emailed this morning to alert us that an ingredient had been dropped from her Blueberry Crisp recipe in today's Herald. The topping ingredients should include 2/3 cup all-purpose flour. We fixed the problem online here, and will run a correction Thursday on 2A of our print edition. We apologize for the mistake, fully aware that a few folks probably will test the recipe, sans flour, and not achieve the desired results. "I thoroughly enjoyed your recipe for pan-fried flounder, but found it difficult to keep the fish from jumping out of the skillet. Is it possible that the recipe called for 1/8 teaspoon of pepper, instead of the 8 teaspoons listed in the paper? We appreciate how many cooks we have out there testing our recipes, and realize that even a dropped character can spoil an entire meal. Sorry, and we'll try to be better. About 450 people die each year in the three-county area of Manatee, Sarasota and Charlotte because either somebody didn't know how to give CPR, or 911 was not dialed soon enough. Learning to dial 911 immediately shouldn't be a problem for most of us. But CPR(cardio-pulmonary resuscitation) is a different deal. Most people are exposed to CPR training in school, then never have to use it as a practical application. If somebody suddenly needed help breathing, could you — would you — be able to help that person? Apparently, too many people could not. "If more people knew CPR, 300 (of the 450) would have been saved,'' Bradenton Fire Department Firefighter and paramedic Dan Hedgeman told Burger. A series of classes will begin this month at Manatee Memorial Hospital in hopes of teaching more people how to administer CPR. Details are here at the end of Burger's story. People who are squeamish about mouth-to-mouth contact with a victim may be relieved that new guidelines from the American Heart Association recommend untrained people provide compressions rather than administer mouth-to-mouth. But the training locally involves both compression and mouth-to-mouth. After all, a life might very well be on the line, and both firefighters and paramedics want us to be competent enough to provide emergency assistance until qualified personnel arrive. Sunday’s Letter from the Editor is another chapter of getting to know our community, believing in our community, and covering our community. And Sunday's Herald is another edition reflecting the challenges and caring that define this amazing community. It really struck me as I read our cover stories again this morning -- life ain't easy. But it's something to be cherished, as the stories of crash victim Christi Charles and little Lexi Antorino make clear. Let's get out there and make a difference -- the sun is shining.